Lee 'Scratch' Perry is one of a kind- we're talking about a (literally) insanely inspried producer/musician/singer/shaman who goes back to early sessions with Bob Marley to producing the Clash and putting out dozens of albums in as many guises- a self-professed lunatic from Jamaica who drops his draws at a press conference, brings a loaded gun on stage and burns down and floods his own studio. His madness premeates not just his public antics but the flood of LP's and CD's he's unleashed. 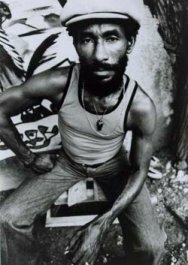 In light of two recent U.S. tours, we pay tribute to Scratch with some live reviews, an in-depth look at a favorite album, reviews of his influence in reggae and other type of music and some words from the man himself.